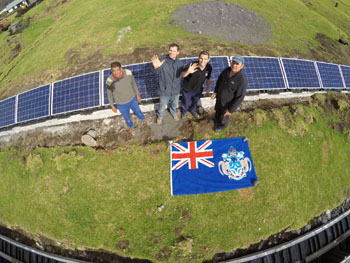 New solar energy panels were installed on Tristan da Cunha in April 2015. 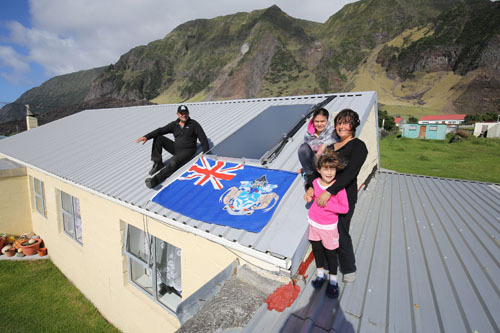 Three solar water heaters have been installed at Tristan homes belonging to Robin and Dawn Repetto, Martin and Iris Green and Simon and Natasha Glass. All are working successfully and so saving bottled gas which is used to heat water in Tristan houses. 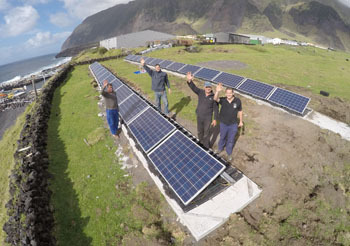 A Solar Farm has been constructed west of the fishing factory on Hottentot Fence field. It consists of 26 solar panels, aligned to face the northern midday sun and each capable of generating 250 watts, so a combined capacity of 6.5kW. The connection to Tristan's electricity grid was made on 30th April 2015 and by 5th May Marc reports that 100kW hours had been generated by the sun. Marc said 'This is a good first step to a greener Tristan'. 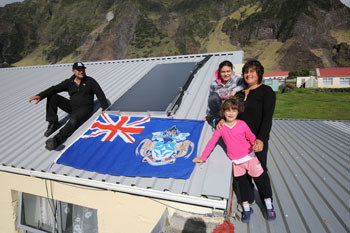 by their new solar panel water heater and the Tristan flag. and manages the CTBTO monitoring station : see CTBTO Station. Left: Another view of the Repetto family taken on 24th April. They left Tristan a few days later aboard the RFA Gold Rover on the first leg of a journey to the Isle of Man where Robin and Dawn will undertake training. Jack Green, Jody Squibb, Marc Escudier and Robin Repetto. Justin Green also worked as an electrician on the project but was absent when the images were taken on 24th April 2015. 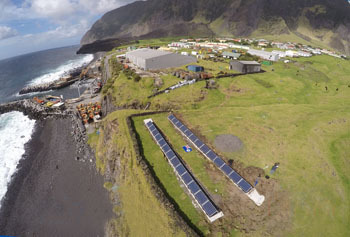 The Tristan da Cunha Government has recently signed a contract with Enviroconsult (who manage the CTBTO station on the island) to trial two renewable energy systems in 2015. The long term goal is that potentially up to 40% of energy could be from renewable means within the next 5 years. The project will be based on a small solar farm and three solar water heaters for individual homes. 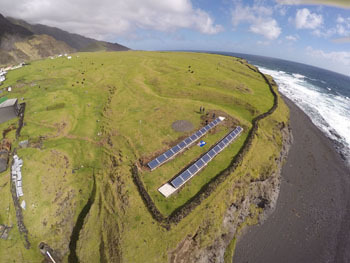 The island will be looking at a combination of technologies to see which is the most practical for Tristan da Cunha. The small pilot project is intended to test theories and identify solutions to becoming more self sustainable in energy for future generations. Several technologies were trialled in the 1980s, such as a wind turbine, but technology has moved on, and it will be important to see where savings can be made for the community. The project is being funded through the EU Development Fund, and further plans are being drawn up to identify other technologies to test in the future. Once all the trials have been completed, we should be in a stronger position to see whether the target of 40% renewable energy by 2020 is achievable for such a remote isle. 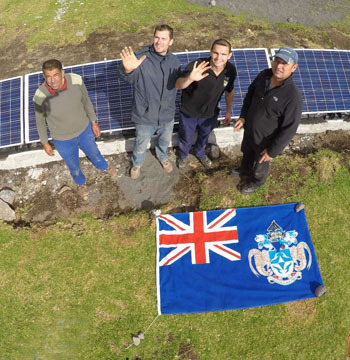 Tristan Chief Islander Ian Lavarello has been able to help shape Tristan's power requirements for the future, thanks to a Renewable Energy Workshop organised by the Foreign and Commonwealth Office in London on Tuesday 4th November 2014. 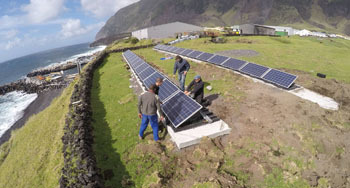 Sourcing accurate and up-to-date information on renewable energy – and how to harness it for Tristan’s benefit – has not always been easy for the island in recent months, with little response from those approached in the UK Government. 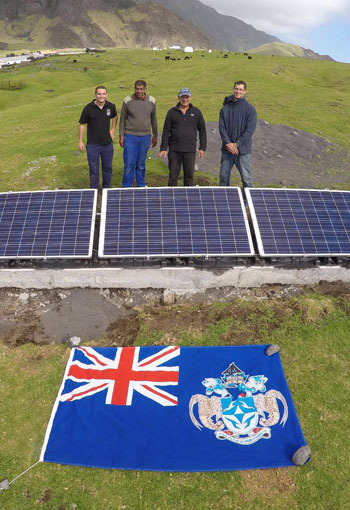 However, through the Office for Renewable Energy Deployment, Ian and representatives of other UK Overseas Territories (including Tristan’s Chris Bates) were able to participate in the workshop in the FCO's Overseas Territories offices in London's Old Admiralty Building. Ian and other participants were able to discuss how a mix of renewable energy is desirable because of problems of lack of storage. Chris said: ”We learned the cost of photo-voltaic panels (for solar power) is dropping; that a site can be built within a fortnight, whereas offshore wind power can be expensive and wave and tidal power is really at an early stage in its development”. He added: “Much of what was said was geared to UK conditions and its economy rather than to those of the territories and some of the presenters may not have been aware of the differences between the UK and it territories. 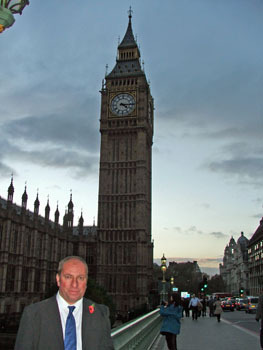 Palace of Westminster and its famous clock tower containing 'Big Ben' behind. “Some systems, such as energy from waste, may not apply to Tristan, because there simply isn't enough of it, but the really good thing to come out the workshop was that Government officials and their contacts now have a better understanding of Tristan's needs and a willingness to discuss with us, how to reduce our dependence upon fossil fuels and enable us to achieve greater energy security at lower cost by generating more of our own power. Ian added: “It was a good, useful event and should benefit Tristan in the long term”.